The Commons are on the right; South Hall is on the left. In order for the Institute to open for business in the fall of 1912, there had to be a place to put the students, at least the male ones. (There never seems to have been any question of housing women–it would have been too complicated.) 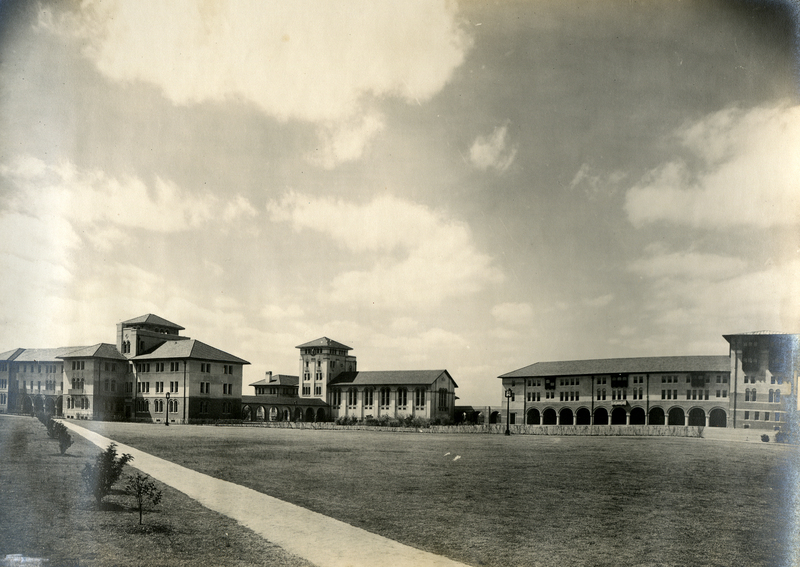 The original General Plan called for four dormitories for men to be constructed along the southern edge of campus. Three were built before World War II, all designed, like the Administration Building and Mechanical Laboratory, by the architectural firm of Cram, Goodhue and Ferguson. 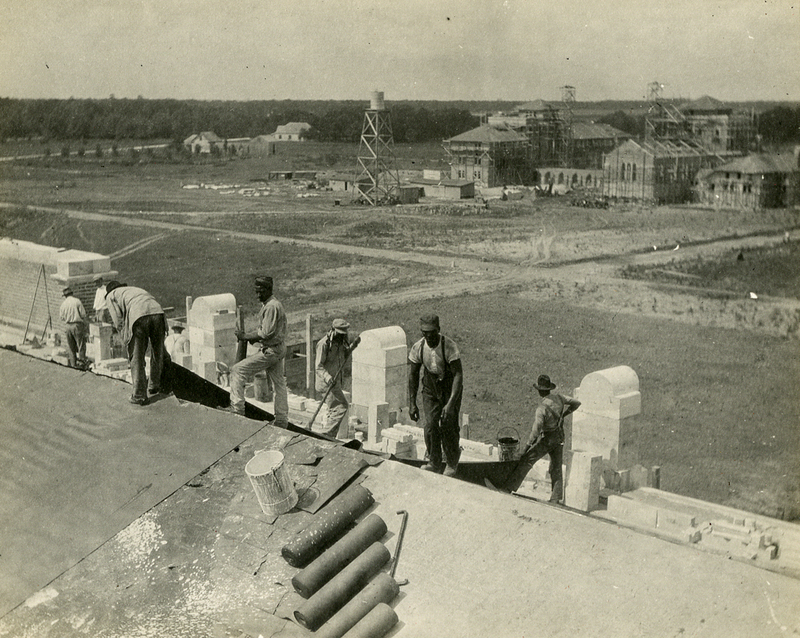 This fantastic picture of the first dormitory under construction was taken in July, 1912 from the roof of the administration building. (I beg you to zoom in on it. It’s a great shot.) The building closest to the water tank (and closest to Main Street as well) was the first residential quarters for students, called South Hall. Today it’s part of Will Rice College. Next to it is the Institute Commons, now part of Baker College. The Commons had a kitchen and dining room, a common room, and quarters for unmarried faculty and graduate fellows in its five-story tower. East Hall is to the right; the Institute Commons in the middle; South Hall to the left. In 1915, a second dormitory, called East Hall, was completed. This is also now part of Baker. The picture doesn’t have a date on it, but it looks like it was taken soon after the building was completed. 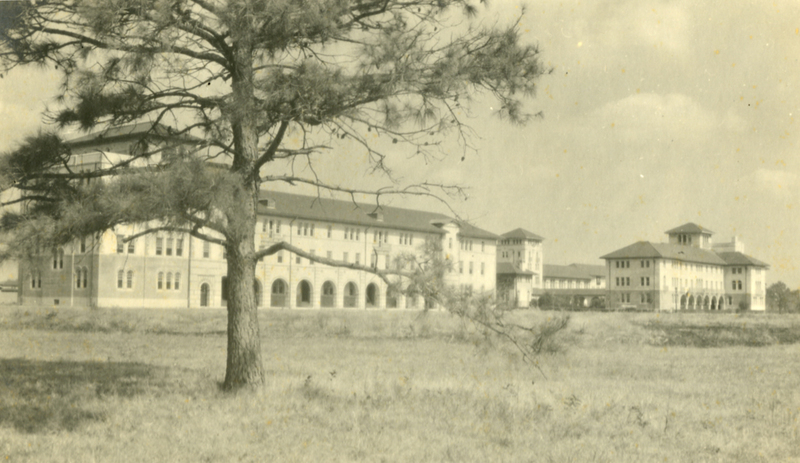 It was also taken from the opposite side than the first picture above, with the photographer standing out by Main Street, so it shows the “back” of the dorms–East Hall is on the right. West Hall is on the left; South Hall is on the right. Finally, construction of the original residence group ended in 1916 with the completion of West Hall (now Hanszen College). This was the last dorm built at the Institute until 1950, when Wiess Hall went up. For anyone interested in more information about why the buildings were designed and placed as they were, I can’t recommend Stephen Fox’s books enough. His Campus Guide to Rice University is thorough and accessible. And if you really just can’t get enough, there’s more detailed information in his short monograph called The General Plan of the William M. Rice Institute and Its Architectural Development. Its available online at the Rice Digital Scholarship archive and sometimes you can find a used copy at Amazon or abebooks. So here comes a shocker. I may have misdated something! 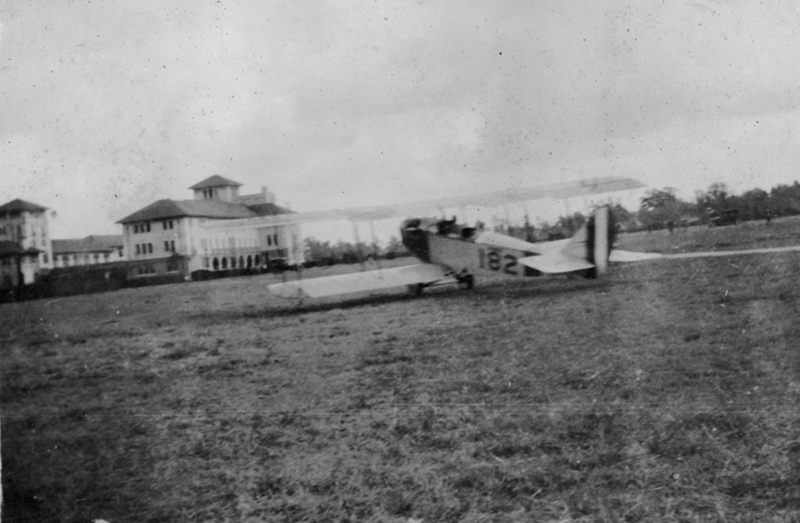 When I was writing earlier about airplanes on campus, I claimed that this picture was taken in 1917. I admit that this was a guess, but I think now that it might have been a bad one. The plane is pointed right at South Hall and you can see the Commons to the left. But I can’t see either East Hall or West Hall, although they may be obstructed or only just out of camera range. So I have an airplane question: was this kind of plane around in 1915? Anyone? East Hall can be seen in the background behind South Hall in both the photo with the airplane and in the previous photo taken from about the same angle. In both of these there is a clear break that can be seen between the dining hall roofline and East Hall’s roofline. In addition, the western-most window on the south side of East Hall can be seen in both photos. To convince yourself of this check out the windows on the clear photo showing South and East Halls. In the second photo (East Hall after completion), there’s a gap between the Commons and East Hall. If you zoom in on the gap, there’s a cloistered walkway with three arches running between the two buildings. That gap no longer exists. At some point, the Commons was lengthened so that it abuts East Hall (Baker’s Old Section) at one corner. Does anyone know when that modification to the Commons was made? Bob–I see it! You’re right. James–I don’t know, but I’m confident I can figure it out. Give me a couple days. I’m working with the upcoming Baker Shakespeare production of Hamlet, and noticed that Baker Commons currently contains a small historical display about the college buildings. After looking at the early photographs and counting windows there and in the current building, I believe it’s fairly clear that the section known as the “Outer Commons” was added to fill the gap James mentions. I wonder what kind of structural elements are still inside the partition that forms a sort of “rood screen” between the two segments.